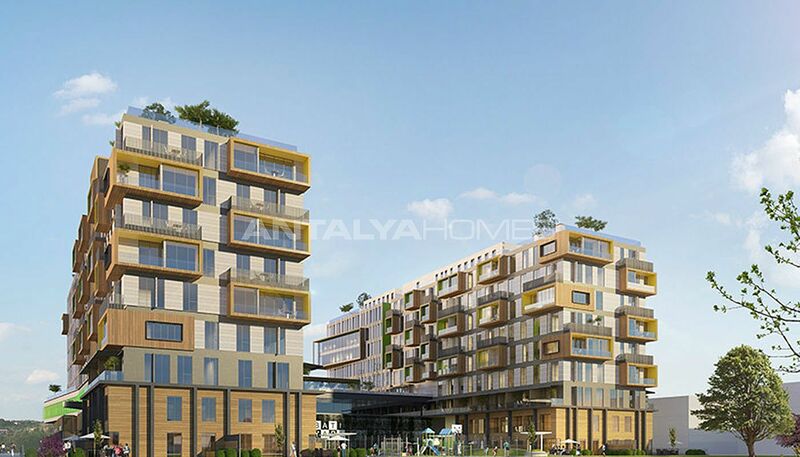 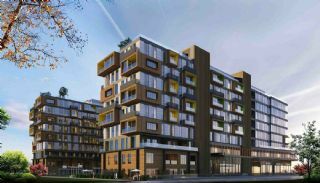 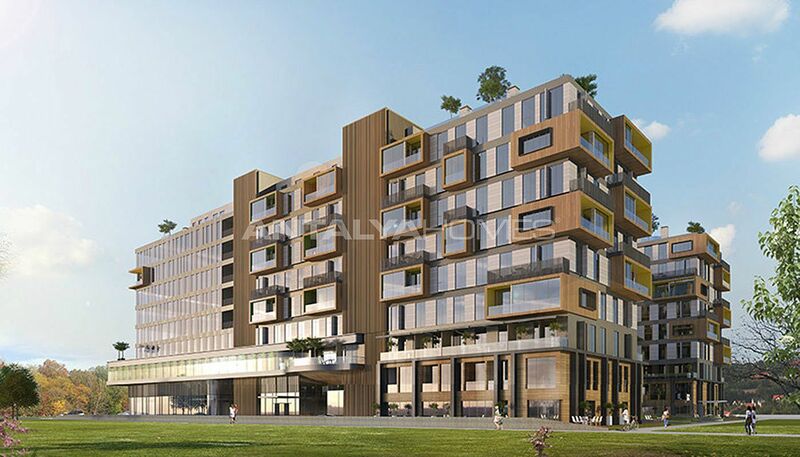 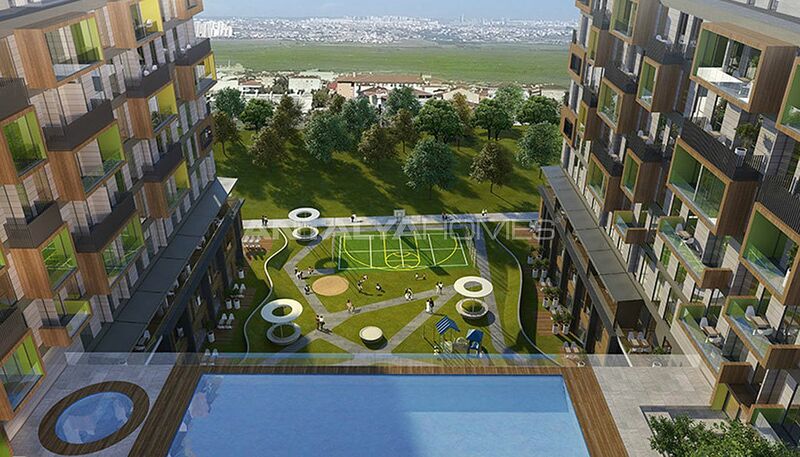 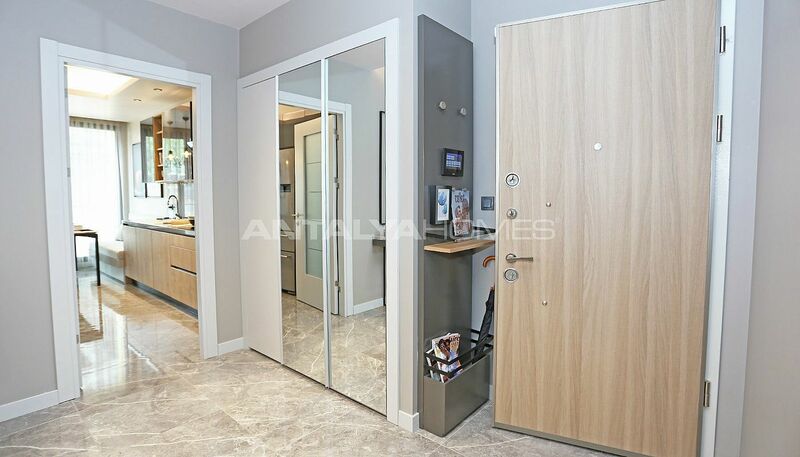 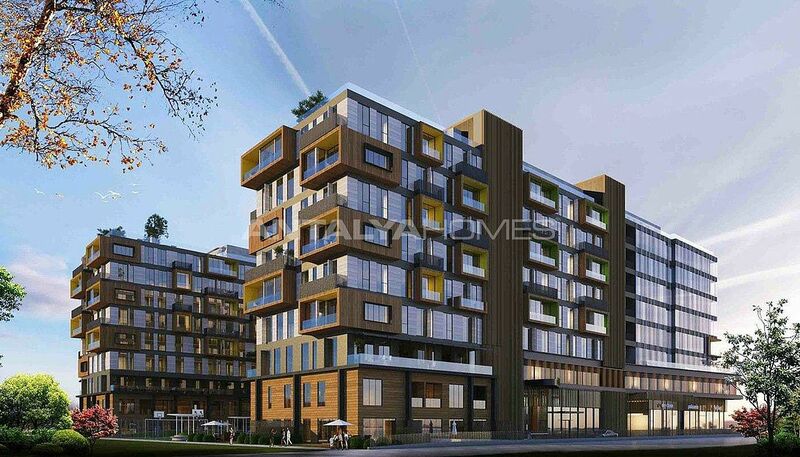 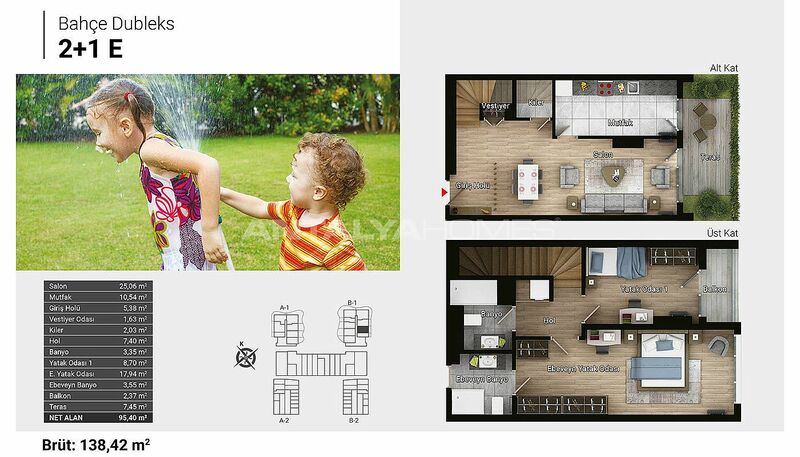 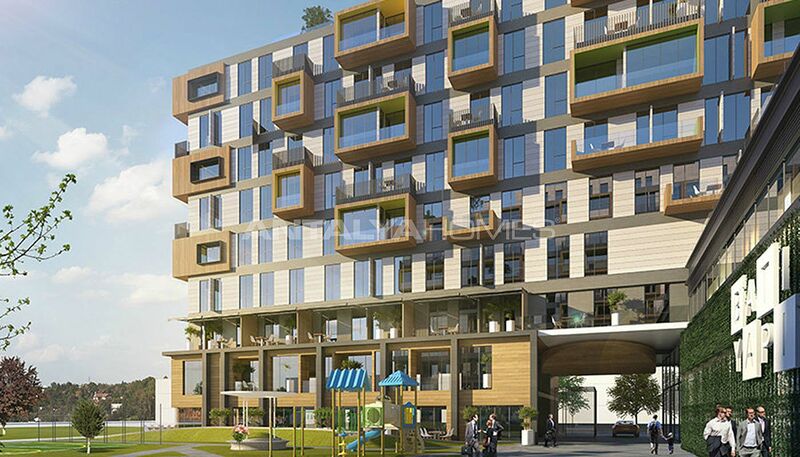 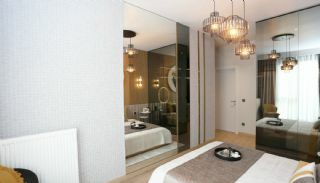 Exclusive apartments are located in Avcılar, İstanbul, it is a district at the European Side. 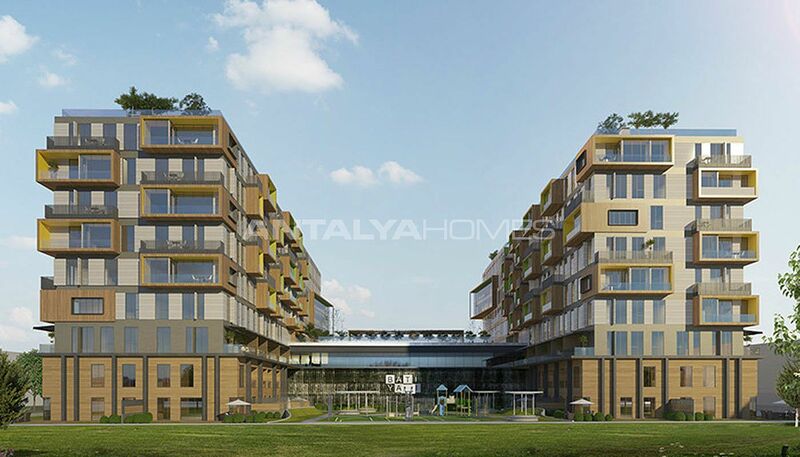 The district hosts many private schools, banks, hospitals, markets, mosques, cafes and restaurants. Transportation is easy to TEM and E-5 Highways from here. 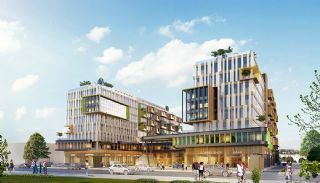 There are many industrial areas and business offices in this region. 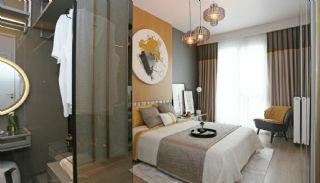 The region is developing fastly day by day. 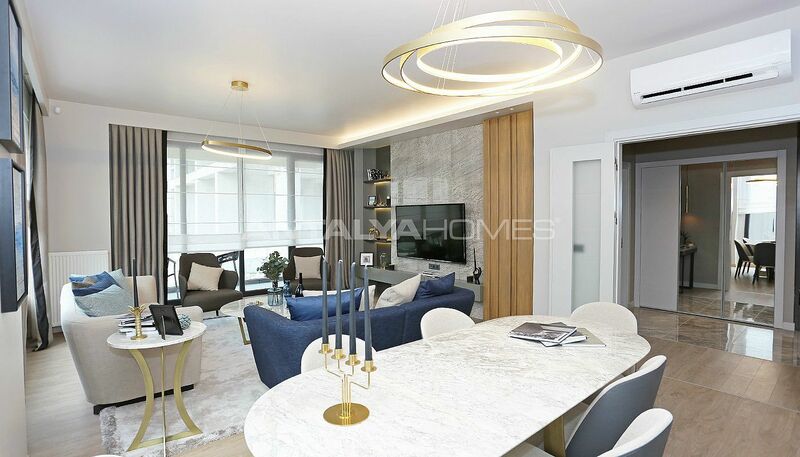 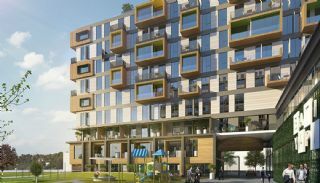 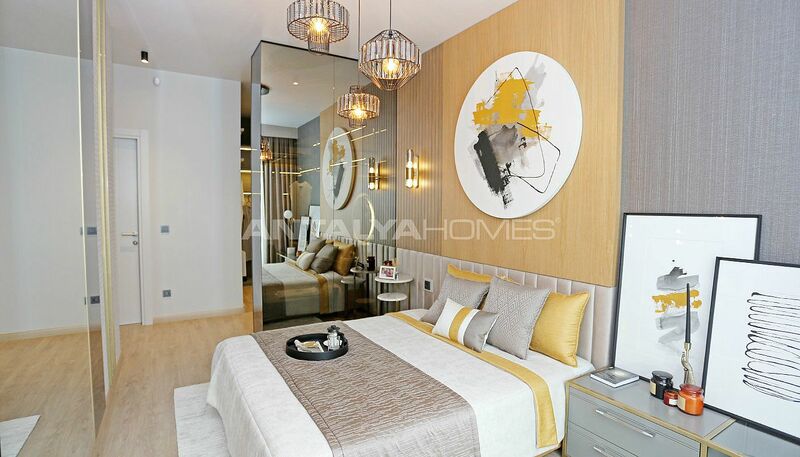 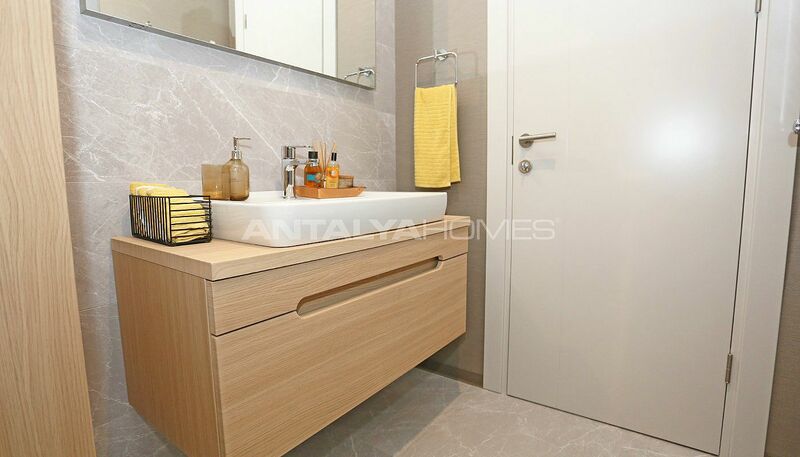 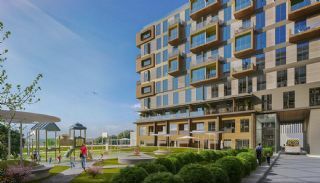 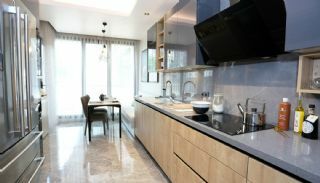 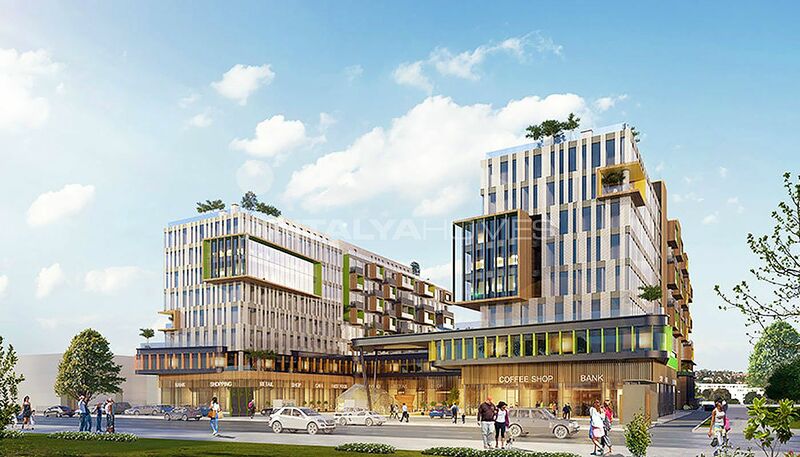 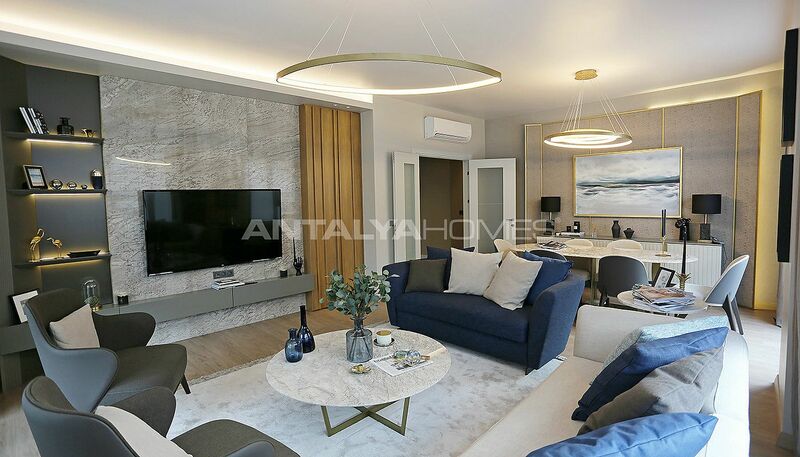 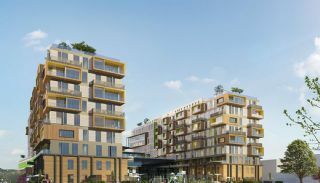 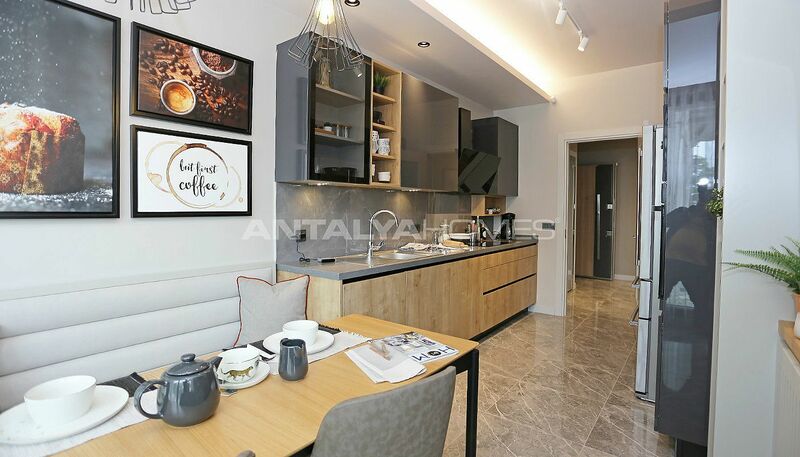 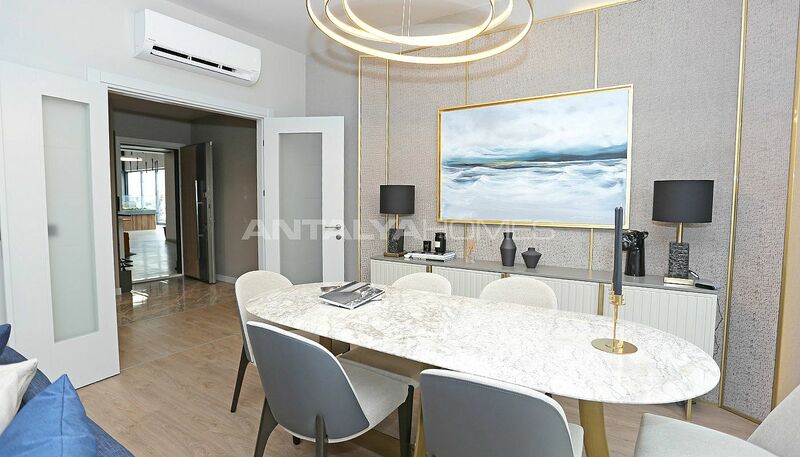 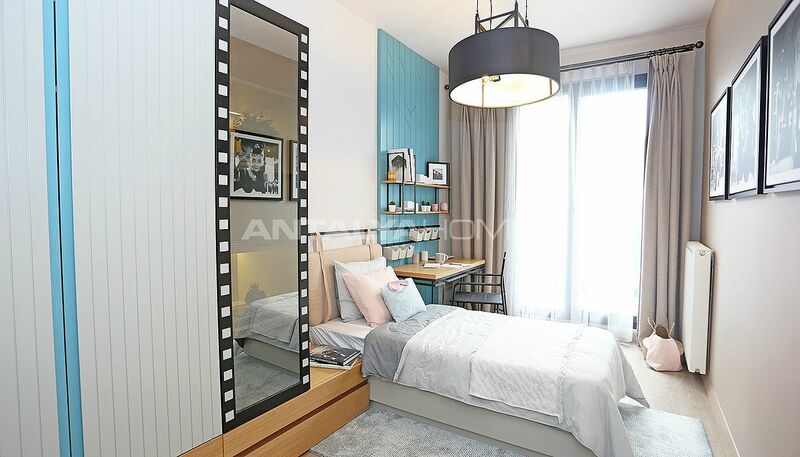 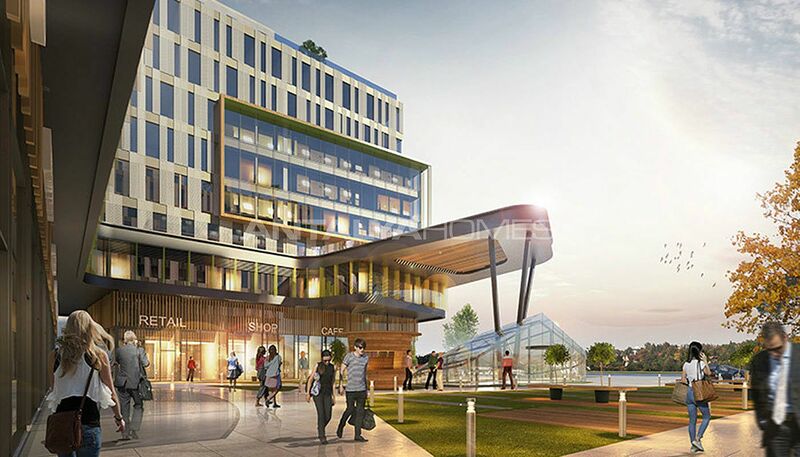 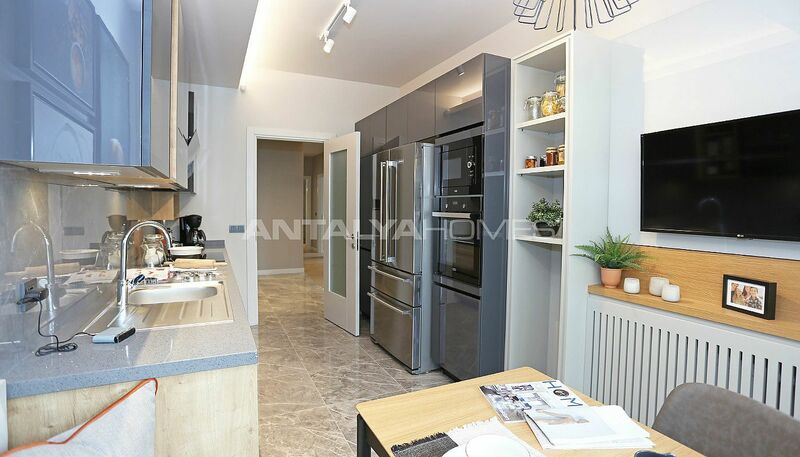 Luxury apartments in İstanbul are 1 km to E-5 and Metrobus, 2 km to Canal İstanbul, 3 km to Küçükçekmece Lake, 5 km to TEM Highway, 6 km to İDO Seabus Port, 7 km to Avcılar Coastline, 8 km to TUYAP Fair and Congress Center, 15 km to Atatürk Airport and 43 km to the New İstanbul Airport. 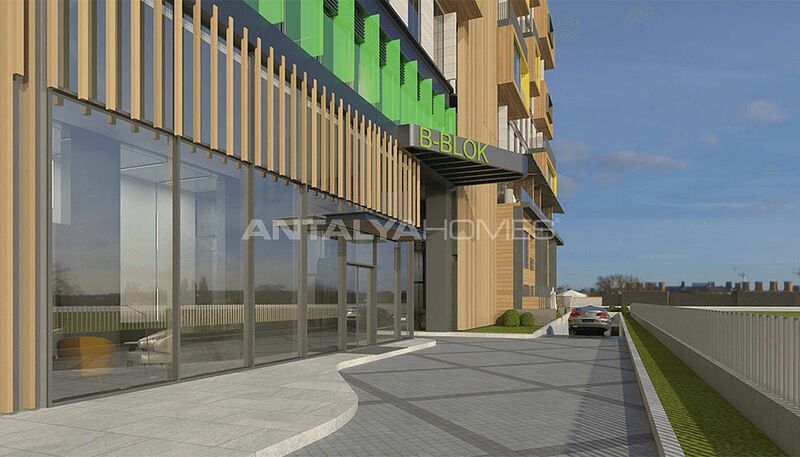 Hospitals in the region: Medicana Avcılar Hospital, Etik Life Medical Center, Doğa Hospital, Avcılar Hospital, Avrupa Medical Center, Avcılar Anadolu Hospital, Private Düzey Eye Center, Private Elitium Medical Center, Mutlu Yaşam Medical Center, Asya Eye Center, Medilife Hospital and Liv Hospital. 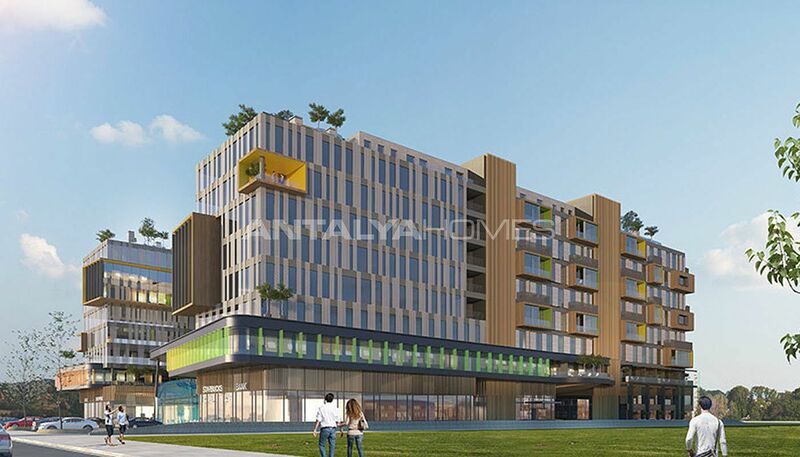 Schools in the region: Işık Schools, Mektebim Schools Avcılar, Bahçeşehir College, Mesleğim Health School, Doğa College, Okyanus College, Esenyurt University, Gelişim University and Istanbul University. 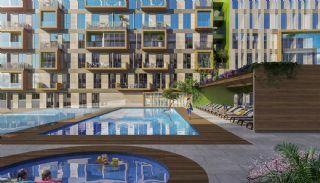 Shopping Malls in the region: 5M Migros, Akbatı Shopping Mall, Mall of İstanbul, Metropol Shopping Mall, City Center Shopping Mall, Torium Shopping Mall, Pelican Shopping Mall and Otoport Shopping Mall. 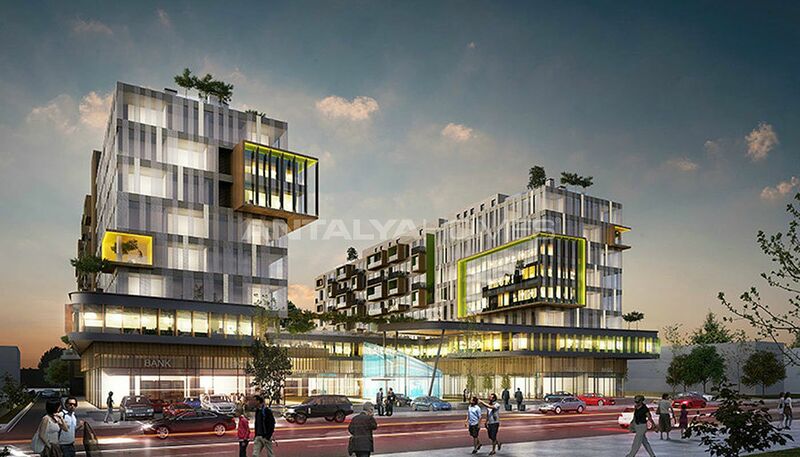 Industrial areas and business centers in the region: Borusan, Evren Car Industry, Avcılar Industriel Zone, Fatih Industriel Zone, Beylikdüzü Organized Industriel Zone, Doğuş Automotive, Haramidere Industriel Zone, Beysan Industriel Zone, CNR Expo İstanbul Fair Center and TUYAP Fair & Congress Center. 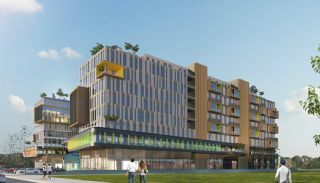 The mixed project is built on 58.000 m² land area. 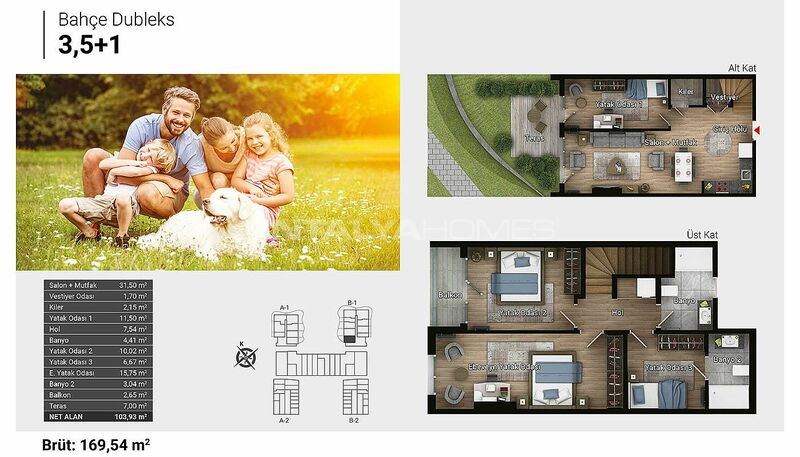 It consists of 4 phases. 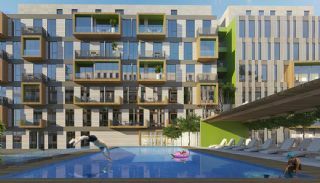 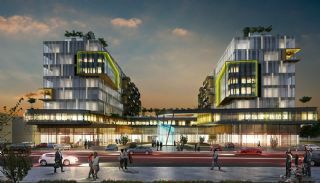 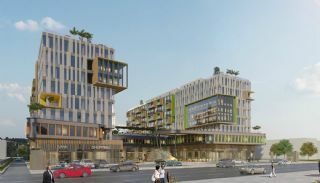 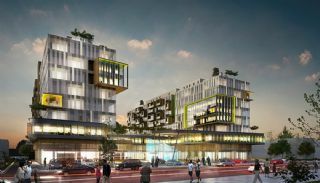 The first phase has 9.583 m² land area, 4 blocks with 8 storey and a total of 269 apartments, 52 home-offices & 75 shops. 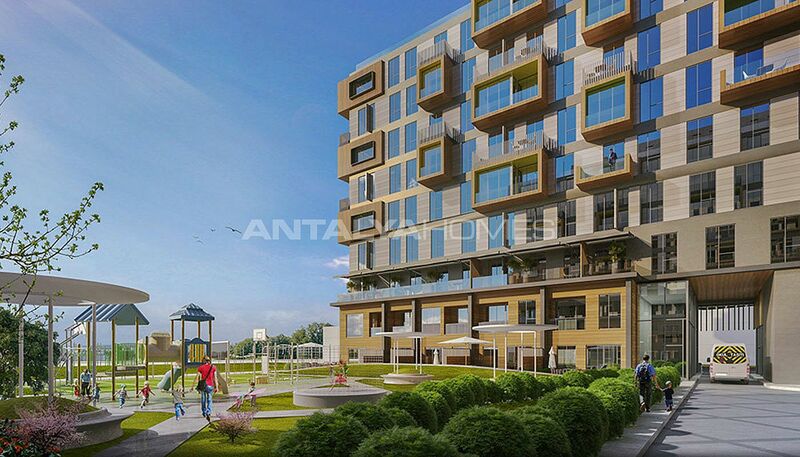 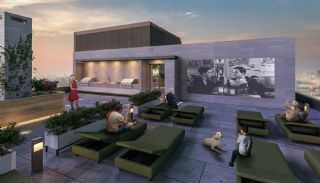 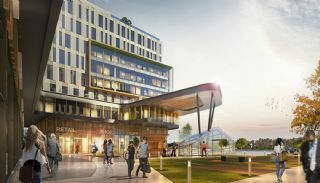 This mixed-use complex has many privileged facilities like a reception, indoor swimming pool, children’s swimming pool, sunbathing terrace, pool cafe, fitness center, pilates saloon, sauna, steam room, tepidarium, multi-purpose sports field, indoor and outdoor children’s playgrounds, sandpit, trampoline park, terrace cafe, walking paths, terrace lounge, presentation and conference rooms, mini movie theater and PlayStation room, collaborative study and hobby rooms, pergolas, barbeques terrace, guest house, billiard, multi-purpose exhibition and presentation hall, table tennis, prayer room, 24/7 security, lift, generator, water tank, hydrofor, outdoor and indoor car parking areas. 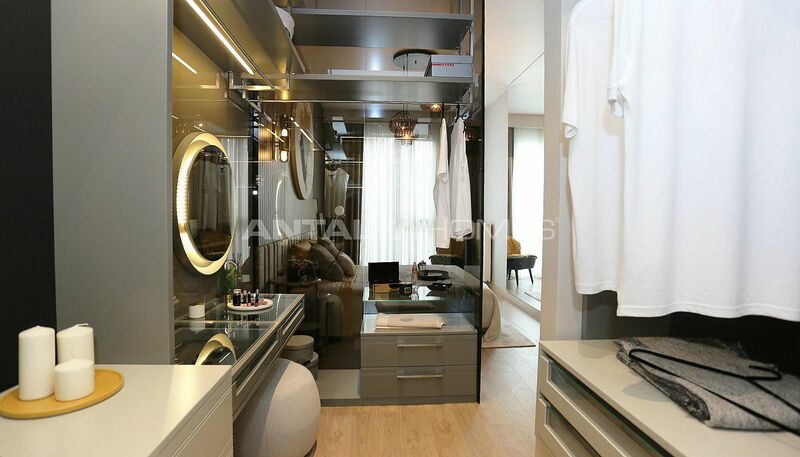 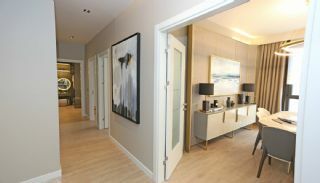 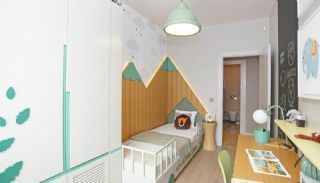 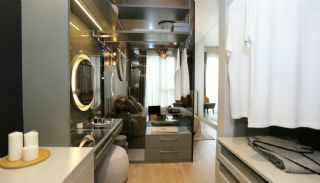 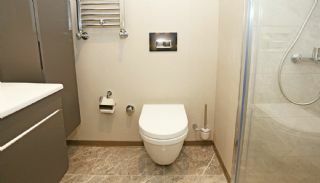 Studio apartments are 42-47 m² with a living room, an open-plan kitchen and a bathroom. 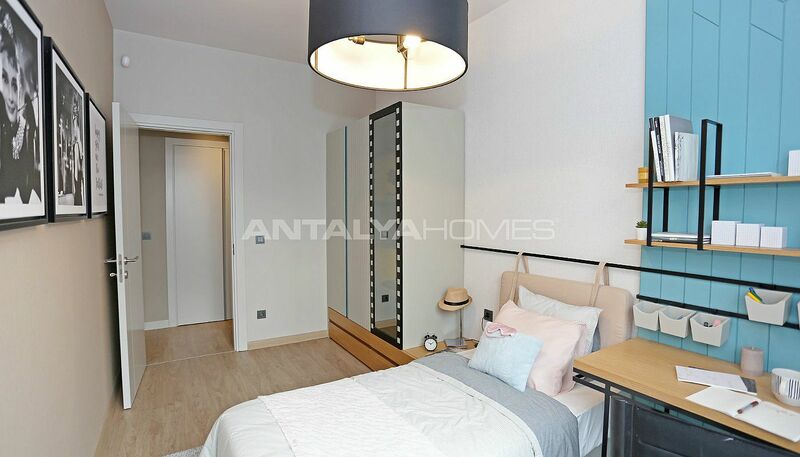 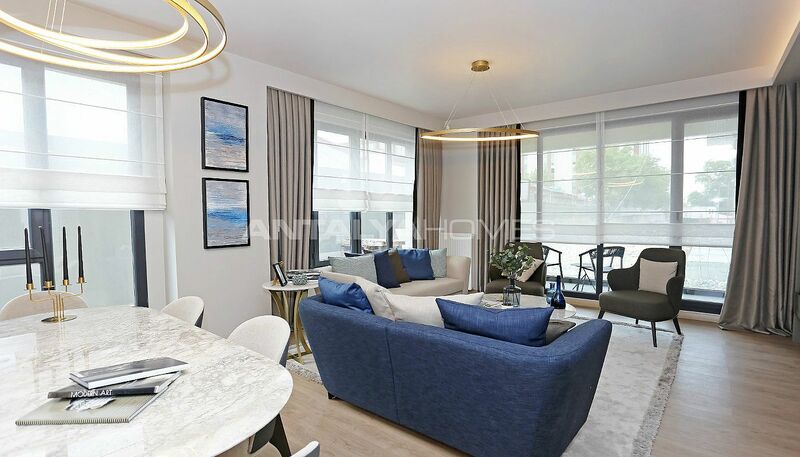 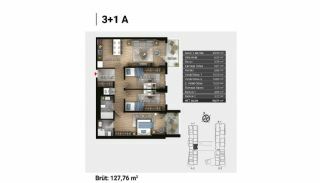 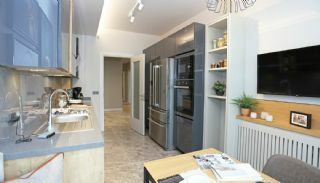 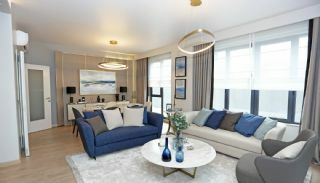 2 bedroom duplex apartments are 138-147 m² with a living room, an open-plan or a separate kitchen, a bathroom, an en-suite bathroom, a cellar, a balcony and a garden terrace. 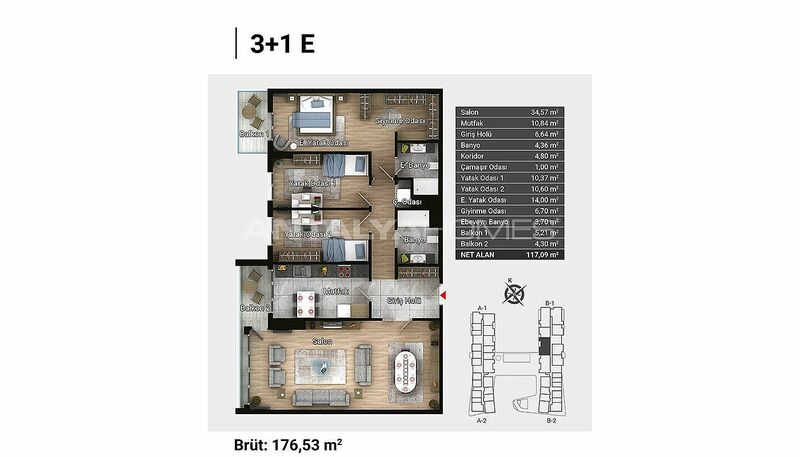 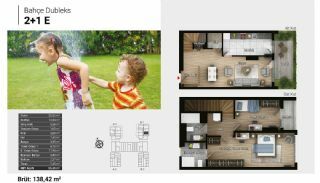 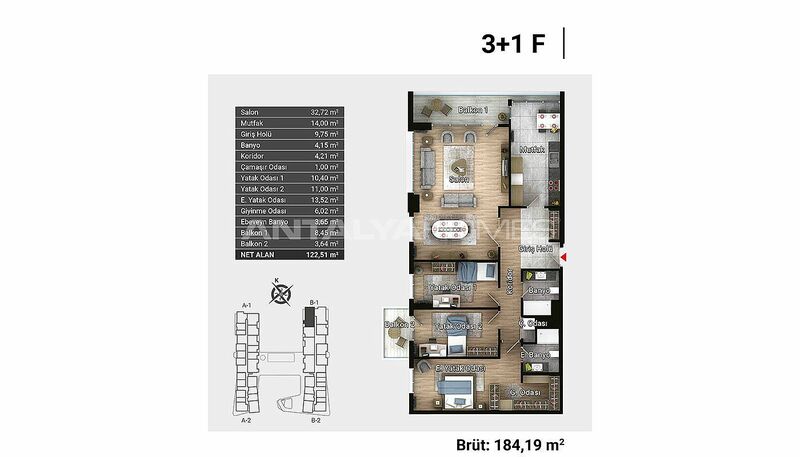 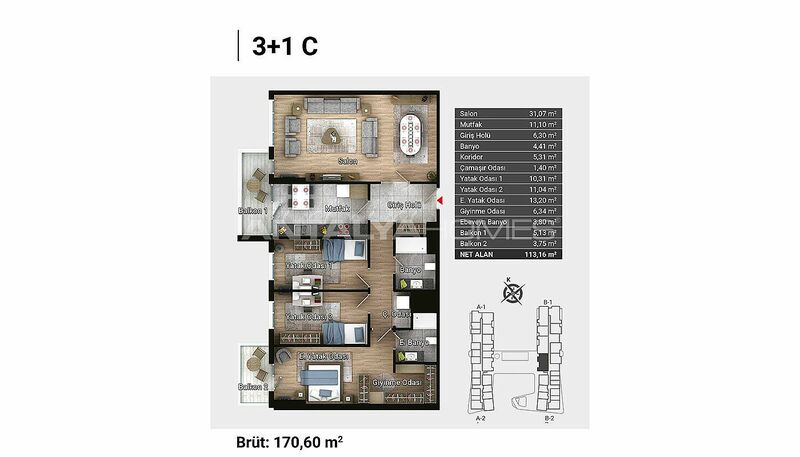 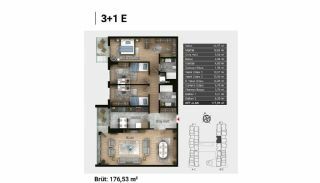 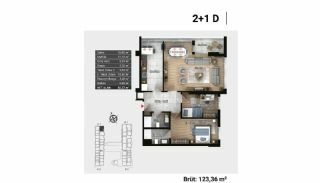 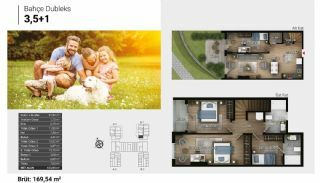 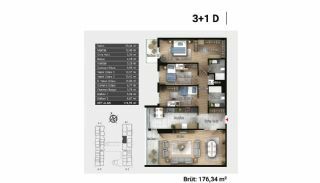 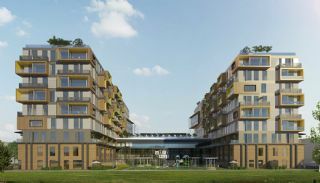 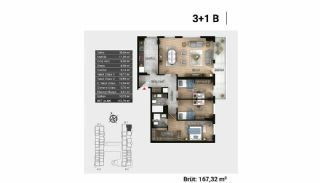 3,5 bedroom duplexes are 169 m² with a living room, an open-plan kitchen, a bathroom, an ensuite bathroom, a cellar, 2 balconies and a garden terrace. 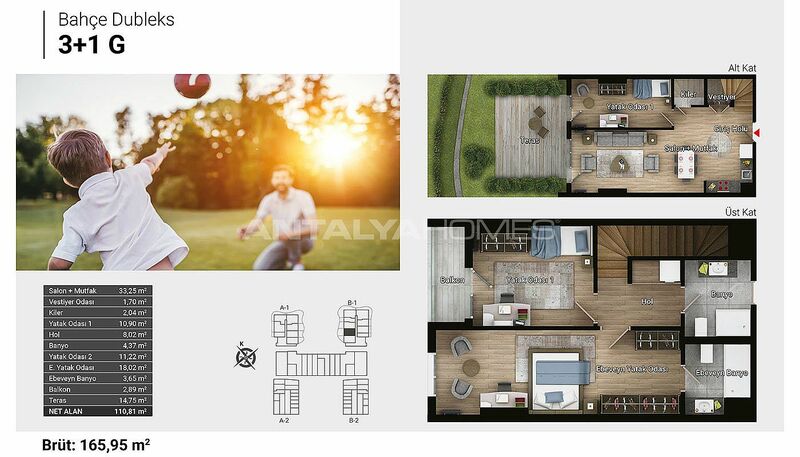 Studio type home-offices are 40 m² with a living room, an open-plan kitchen and a bathroom. 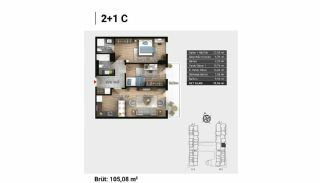 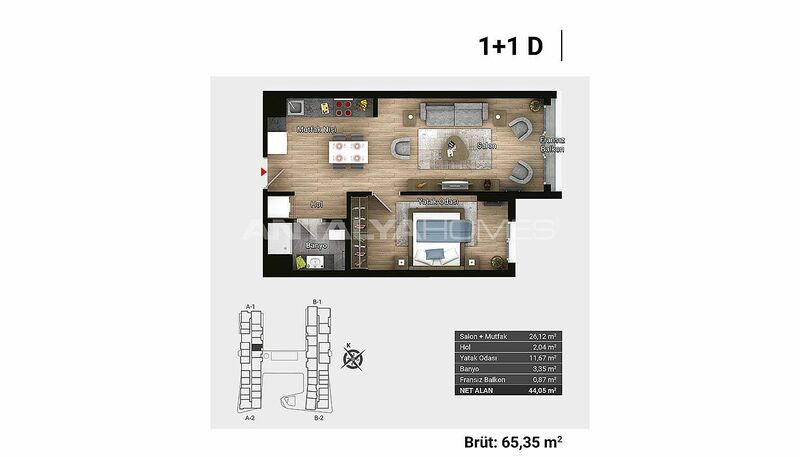 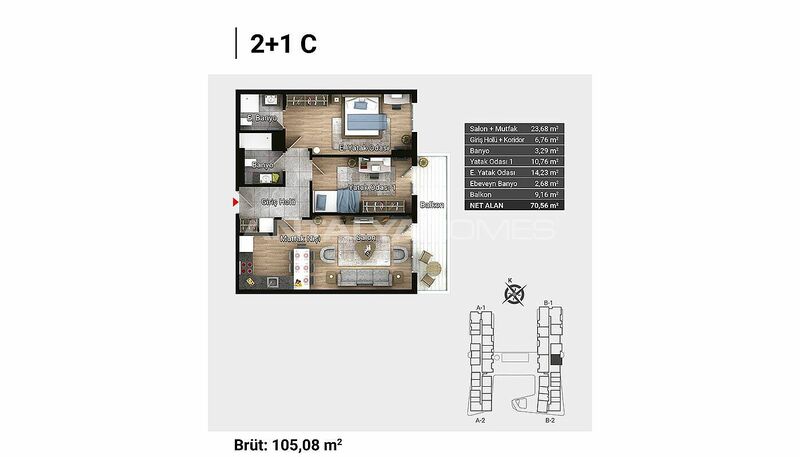 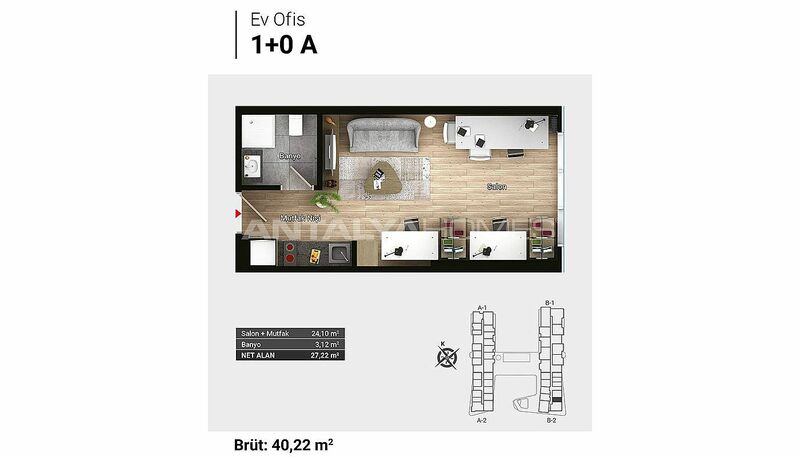 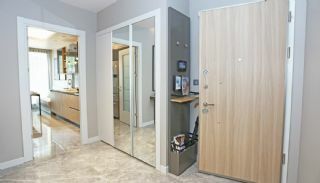 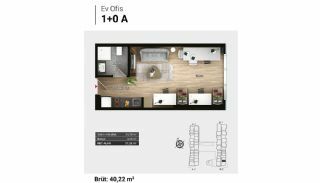 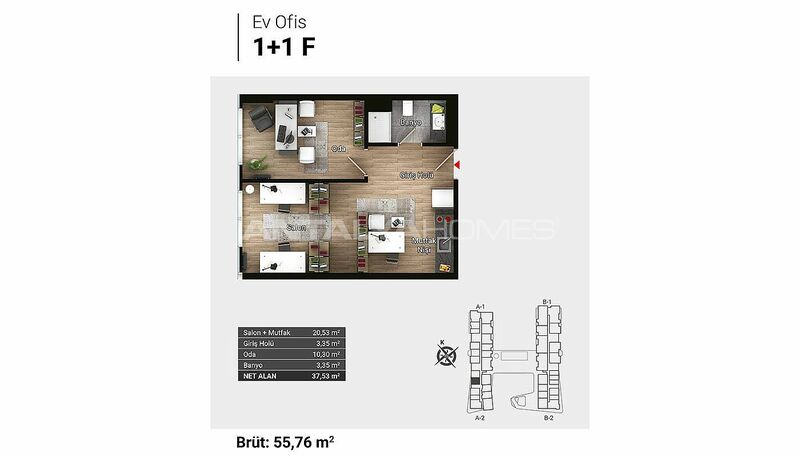 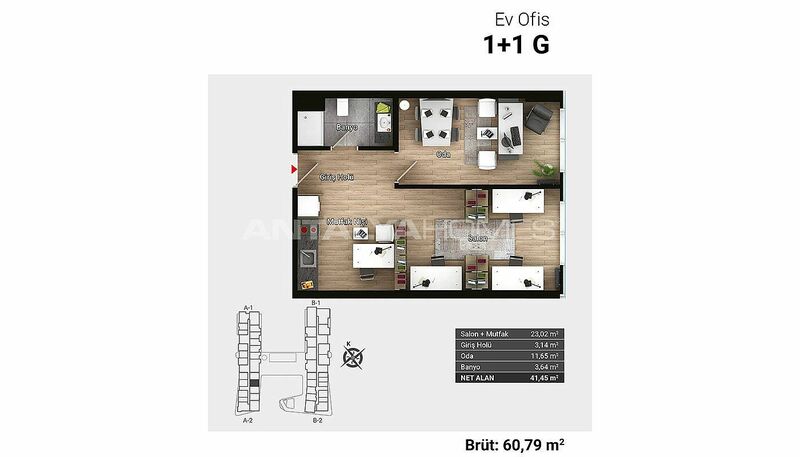 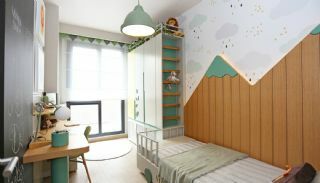 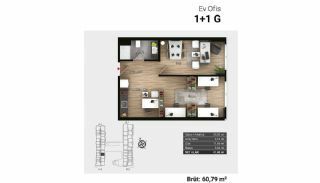 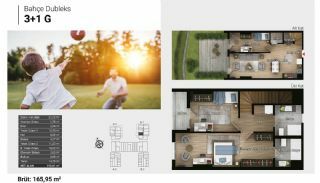 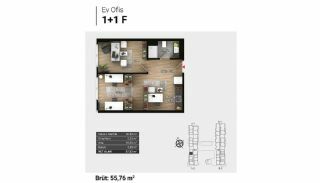 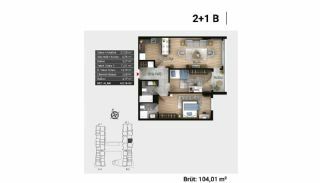 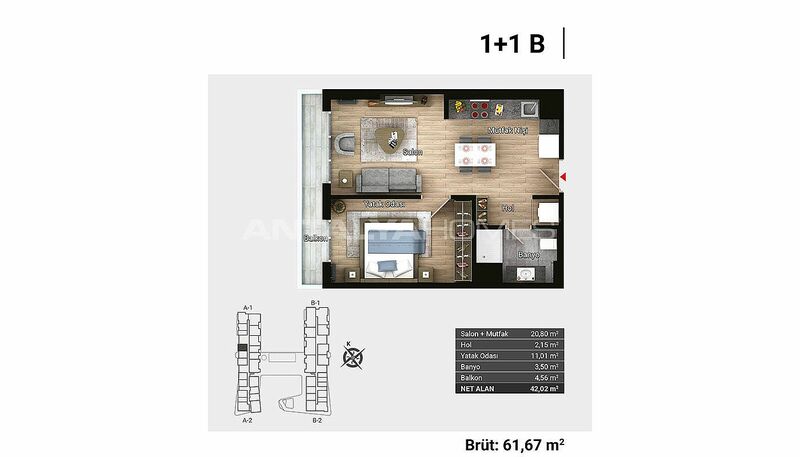 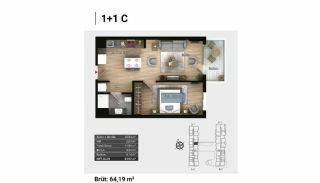 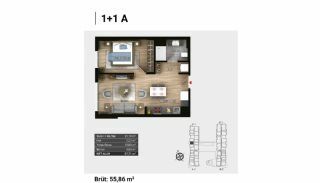 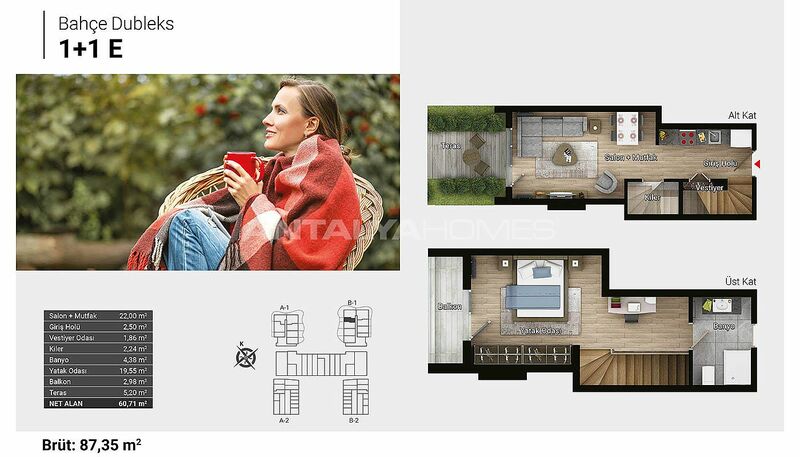 1 bedroom home-offices are 55-64 m² with a living room, an open plan kitchen and a bathroom. 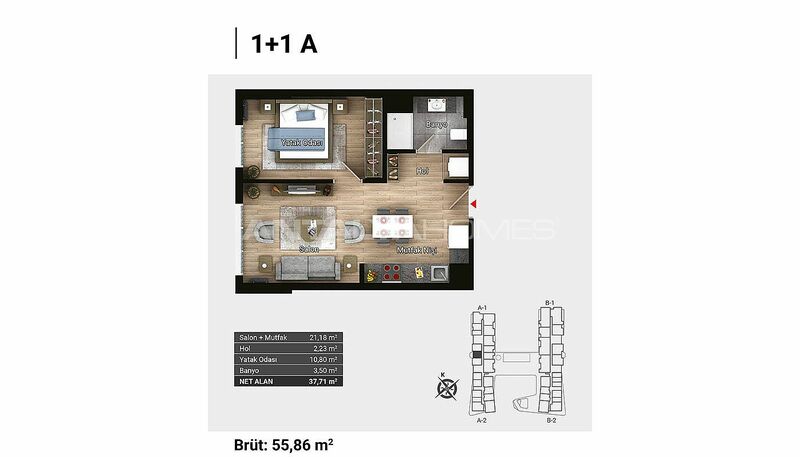 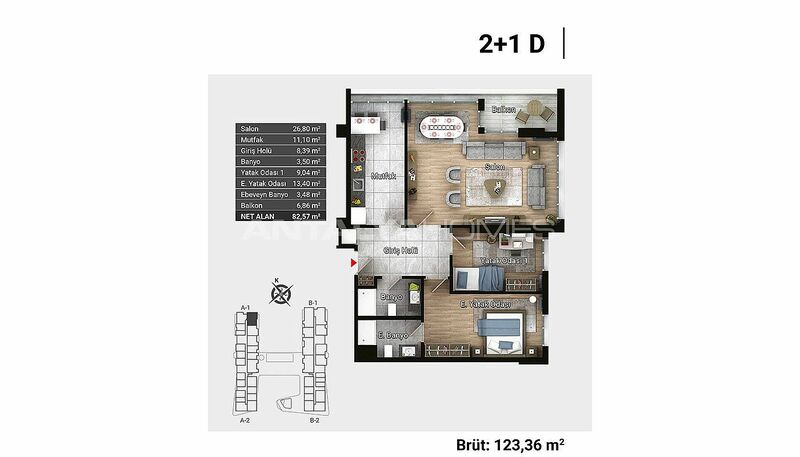 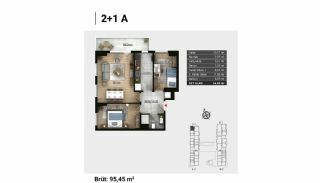 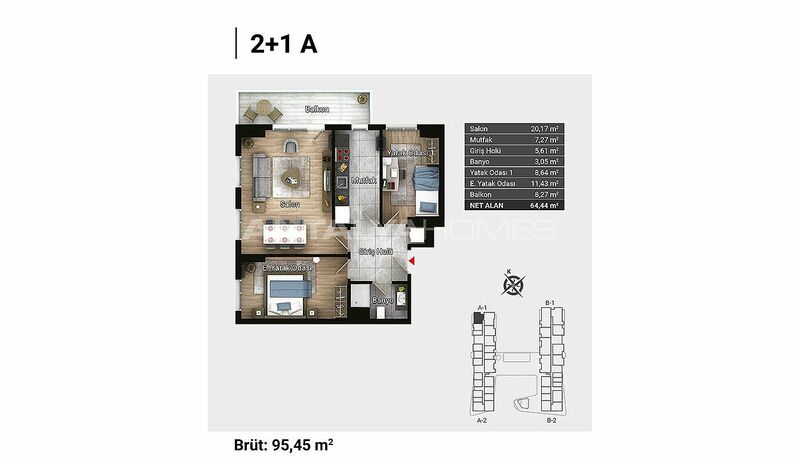 3 bedroom home-offices are 87-131 m² with a living room, a separate kitchen and a bathroom. Luxury apartments are equipped with many features such as smart-home system, central hot water, natural gas, video intercom system, central cable TV, satellite TV system infrastructure, cloakroom and steel door.